It's time to confirm what you know and find out what you missed so you can start the year off right from a compliance standpoint. 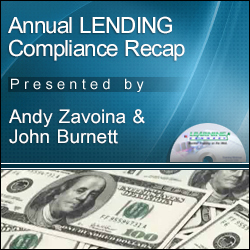 A review of changes to the loan rules and regulations is important, as is a look at enforcement actions, court decisions, exam trends and more. Compliance Officers are still dealing with TRID. In fact, many are still dealing with the math - what costs go where and what reimbursements have to be made and what if it was all the title company's fault? There is a lot to address, plus 2017 hasn't been a sleeper for new and revised requirements. New HMDA rules are ready for real-time, the Military Lending Act changes took effect, and the flood rules (which are always a major problem) are changing, too. Did you know the current proposal is to raise the fine to $5,000 per occurence? And these are just three major examples that are enough to keep you busy all year. But wait, there's more. Many banks suffered regulatory penalties. There are valuable lessons to be learned from another bank's mistakes and it may be your chance to tweak policies and procedures to avoid penalties under UDAAP, flood and various other penalties we can all learn from. So what's new, what's different, and what do you need to focus on in 2017? This recap will help you answer these questions. This webinar is designed for everyone who manages and audits compliance and has lending related compliance responsibilities, including Compliance Officers, Auditors, Lenders, Loan Administration staff and senior management. About the Speakers: John Burnett is a 1979 alumnus of the ABA National Compliance School, and served on its faculty for several years. He graduated with honors with the Class of 1990 from ABA's Stonier Graduate School of Banking. He is also a graduate of the BAI's and the Massachusetts Banker Association's Schools of Banking. Andy Zavoina, CRCM, is a consultant with the Glia Group, best known for its involvement with BankersOnline.com. Andy is a past Chairman of the American Bankers Association's Compliance Executive Committee. He was the 2003 recipient of the American Bankers Association's Distinguished Service Award for his involvement and accomplishments in the field of regulatory compliance management. He currently serves on the Editorial Advisory Board for the ABA's Compliance Magazine, Compliance Action magazine, is a member of the ABA's Compliance School Board and is a BankersOnline Guru. He also served on the Texas Bankers Association's Compliance Committee. He is a graduate of the ABA National Commercial Lending School, National Compliance and National Graduate Compliance School and is a Certified Regulatory Compliance Manager with the Institute of Certified Bankers. He has written numerous articles and lectured on compliance, the use of the Internet and technology as a tool, as well as compliance in cyberspace to local, state and national associations. Internet policies and other compliance related programs are made available on his personal Web site. --> This program was recorded in its entirety in January 2018. The CD-ROM includes program slides, materials (if available) and follow-up Q & A document.